I’m starting to see a pun in this town’s name. Since the reprogramming hasn’t worked Skywatch opts to use the old “plant a time bomb in their head” plan. Unfortunately they did it to Shockwave, who is sent to hunt down the other robots Skywatched “employed” but goes after Soundwave instead. Meanwhile, Hunter and Sunstreaker find another Machniation base, where Hot Rot manages to get the drop on his captors with a trick befitting his name. Back with the Dynobots, the others are ready to walk off until the Headmasters attack Grimlock, igniting just enough loyalty to join him, even after Grimlock calls in the Monsterbots for back-up. What they got wrong: …except for Shockwave but at this point it’s only nitpicking if you ignore Furman’s usual MO. 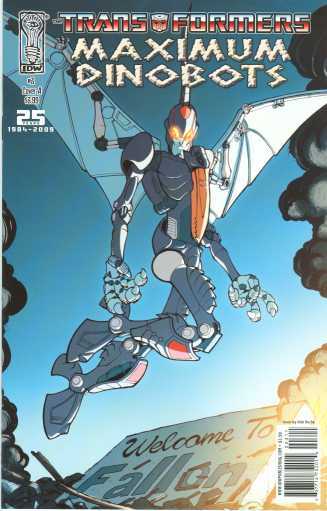 I also don’t care for Swoop’s design, which you can see on the cover. He’s too thin, the face looks more like something out of Transformers Prime than anything in this continuity, and he doesn’t mesh well with the other Dynobot designs. And what does “we still do” mean? Because in context it doesn’t when Swoop says it or when it’s said as Hot Rod collapses from his trick. Recommendation: It’s still a pretty interesting story as Furman finishes off his loose ends. Might be worth a look. Posted by ShadowWing Tronix on June 14, 2018 in Yesterday's Comics and tagged Dinobots, Hot Rod, Hunter O'Nion, Monsterbots, Shockwave (Transformers), Sunstreaker, Transformers.